Union is a township located in north-central Union County, New Jersey. With a population of 69,296 and a fairly low crime rate, Union has been ranked as the 41st safest city to live in the United States according to Safehome. The opioid crisis, however, has been spiraling out of control during the past several years. There were around 100 deaths in Union County last year (2017) due to opioid overdoses which is practically double the amount since 2015. As a matter of fact, since the beginning of the year 2015, over 230 people in the county have died as a result of drug overdoses. Although overdoses by prescription medications are certainly a problem, there is a huge up-rise in heroin-related deaths over the past few years. According to a Union County prosecutor, drug dealers are cutting heroin with fentanyl which is a powerful opioid used in anesthesia and is around 50 times more powerful than pure heroin. What’s even more disturbing is that while people believe they’re buying heroin, they are sometimes unknowingly taking pure fentanyl. While 20% of drug deaths in 2015 were contributed to fentanyl, over 50% of overdose deaths in 2016 were caused by that extremely dangerous drug. Why is heroin such a popular drug? One reason is that it’s very cheap to buy. The price of heroin is around $3 to $5 on the streets, while one oxycontin pill will sell for about $20. While the town of Union itself isn’t ranked as having the most overdose deaths in the area, it does have one of the higher rates in Union County and the numbers keep rising. In fact, in the entire state of New Jersey, over 1,900 people died from opioid overdoses in 2016. The entire state is in crisis in regards to drug related deaths. 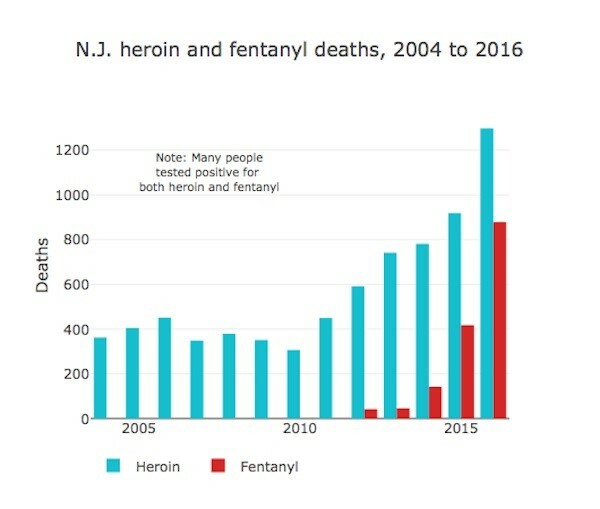 The chart below shows a shocking rise in heroin and fentanyl related deaths from 2004 to 2016. According to a Union County sheriff, the average age for someone to die as a result of a drug overdose is 43 years old. 37% of the drug overdoses in Union County were aged between 50 and 59 years old, while 23% of them were between 40 and 49 years of age. Of the 232 people in the county who died from drug overdoses between January 2015 and September 2017, 61% of them were caused by heroin, while 47% were a result of a fentanyl overdose. And there were exceedingly more males who passed away from drug overdoses than females, registering 71% of the deaths. Another startling statistic is that while New Jersey ranks 39th in the country in substance abuse, the state is ranked first overall for the number of teenagers who have had drug related experiences at school according to a 2017 study. A whopping 30.7% of high school students have either sold, bought, or were offered drugs during school hours. And 70% of teenagers who abused prescription drugs were obtaining them from either a family member or friend. Although heroin is the biggest problem in the state, alcohol is ranked as the second-most abused substance. People who got arrested for driving under the influence of alcohol rose from an average of 1,304 arrests per month in 2015 to 1,522 per month in 2016 according to the New Jersey Department of Transportation and Highway Safety. What’s even more disturbing is that 15% of high school students reported having their first alcoholic drink prior to 13 years of age. There is, however, a program called the “Community Law Enforcement Addiction Recovery” or C.L.E.A.R. program which offers recovery help free of charge to people who are suffering from addiction. How this program works is that individuals can go to the Union County police department or sheriff’s office and give them any drugs they have in their possession. As a result, they will not be charged with any crime and they will receive treatment free of charge. In fact, they have beds reserved at two different treatment facilities – one in Patterson and the other in Monmouth County. Another option is to enter one of Summit Behavior Health treatment facilities that deal with drug and alcohol addictions. They have a medically supervised detox facility (called Serenity at Summit) in Union located at 1000 Galloping Hill Road (1-908-481-4400). They also have outpatient treatment at 2780 Morris Avenue, which is also located in Union (1-908-481-5050). These facilities are run by very qualified experts in the clinical, medical, and holistic departments who will also make sure you have complete privacy and discretion. There is a four-step admissions process involved with getting into a Summit Behavior Health facility. You will first contact an addictions specialist at the facility via either online or a phone call. They will then ask you for specific background information regarding your history of drug and/or alcohol abuse. Thirdly, after they receive all of your information, they will prepare a customized admissions package which will ensure you get the best treatment possible. Then finally it will be time to begin your new journey to living a beautiful life of sobriety. They will set up a date and time for you to enter one of their facilities where you will participate in a medical and psychiatric evaluation so they can provide you with a beneficial program for your treatment. Shortly after you are admitted into one of their programs, a clinician will perform an intake assessment which will focus on your substance abuse history. After the assessment and with a customized treatment plan, you can then begin the recovery process which will include holistic treatments and several therapy sessions. Individuals with severe drug and/or alcohol dependency sometimes require a detox center to help with their intolerable withdrawal symptoms. If this is the case, Serenity at Summit is a detoxification center based in Union that has staff on stand-by 24 hours a day, 7 days a week, and provides the most recent clinical, medical, and holistic programs available. Their program offers care beyond just detoxing. They also offer counselling and treatment to individuals who have underlying mental health issues, such as anxiety and/or depression which are often contributing factors with addictions. Summit Behavior Health facilities provide holistic treatment programs which focus on healing the entire person – mind, body, and soul. With addressing total care from physical to mental health, it will provide individuals with an even better opportunity to remain sober for the rest of their lives. Here are some treatments available in their Holistic Detox Program: reiki, yoga, meditation/mindfulness, acupuncture/acupressure, nutritional/wellness assessments, meditation, creative arts therapies, journaling, hypnotherapy, and massage. They have individual therapy sessions which include: eye movement desensitization and reprocessing, family focused therapy, cognitive behavioral therapy, brain spotting, bio-feedback, dialectical behavior therapy skills, and trauma informed sessions. They also have group therapy which is normally held twice daily and includes: 12 steps of recovery, wellness skills, emotional regulation, stress management, motivational enhancement, mindfulness training, medical education, relationship building, and relapse prevention. Summit Behavioral Health facilities offer world-class programs for anyone suffering from alcohol and/or drug addictions. However, while they do offer treatment for teenagers, their inpatient residential center only takes individuals who are 18 years of age and older. Serenity at Summit is a 40-bed inpatient facility that has been recently renovated and has new medical equipment, as well as new furniture to help make everyone’s stay as comfortable as possible. Their residential treatment program offers everything from customized alcohol and drug detox, to full body and mind holistic activities. If you decide to enter an inpatient treatment program, you will be evaluated with an initial assessment within your first 24 hours of being there. The assessment will contain medical and clinical evaluations, including a full history of the patient. Once they get all of the necessary information, the clinicians will customize a treatment and recovery plan designed specifically for the individual. They offer overall wellness programs that will help individuals live a long healthy life free of addiction. Some of these programs include a medical and holistic detox program, combined with several therapeutic activities such as individual and group counselling, 12-step meetings, and yoga. As for the cost, they accept coverage from the majority of insurance companies. For those who don’t have insurance, they have the option of paying privately through different financing options which are affordable to clients. Once you have completed one of their inpatient care programs, there is still a long road of recovery ahead, which is why outpatient treatment programs are so important. Summit Behavioral Health works with each patient individually to insure the proper steps will be taken in this very important next chapter in the recovery process. And there is an outpatient treatment facility right in Union. In order to reduce the risk of relapsing, outpatient programs will guide you on how to live your everyday life but with making some important lifestyle changes, in addition to providing ongoing support to individuals who are in recovery. Outpatient programs are also ideal for people who don’t have the option of going into an inpatient treatment facility long-term, but who want to fit a recovery program into their lives. This type of treatment is good for individuals who can’t put their lives on pause and who have family, education, or career responsibilities that they need to tend to. There is also a high level of privacy and anonymity in attending these outpatient programs. These programs include individual and group therapy, educational programs, ongoing support, and family counselling. They also have a very flexible schedule that can include daytime, evening, and/or weekend sessions. One great example is the 12 step program. It is held in a group therapy setting to help people who have struggled with addiction problems. There are 12 step programs for pretty much every type of addiction, including Alcoholic Anonymous and Narcotics Anonymous. When individuals graduate from their treatment program, it is far from the end of their journey to living a sober life. When clients attend a treatment facility, the staff at Summit communicates with that person’s doctors and they keep the communication lines open long after the treatment process is finished to make sure the recovery process is still going well. As mentioned above, there are also great outpatient options for those who wish to continue receiving treatment after they return home from rehab. These outpatient programs offer counselling, holistic therapeutic activities, and medical services, just to name a few. The lines of communication are also open between clients and staff members. There is always help available via phone or email for former patients who have graduated from the programs and who may need to speak to a staff member at Summit. Their team is dedicated to the continuous recovery of their former patients and even offer follow-up calls for one year after treatment to make sure the client is still thriving in the recovery process. They encourage former clients to keep in touch by engaging in their social media and online community for inspiration, new information, or just to connect with other graduates of the program. They also have social, educational and recreational events consisting of current and former patients to connect, socialize and help each other through the recovery process. One of the most important aspects in recovery is family. A client’s family play a very important role in the treatment and recovery process. And seeking help for family members is also an important step for both the client and their loved ones. Watching a loved one suffer from addiction can be extremely hard to watch and there are free meetings available to family members that offer education and support for them to help deal with their own struggles of watching the affects of addiction. Another option after graduating from your treatment program is to move into a sober living facility. Getting back to everyday life can be hard after rehab, especially with the temptation to relapse; therefore, a sober living house is an excellent idea for those who are afraid of relapsing. If you move into a sober living house, you will be with other people who have similar struggles as you and they work together to help and support each other.